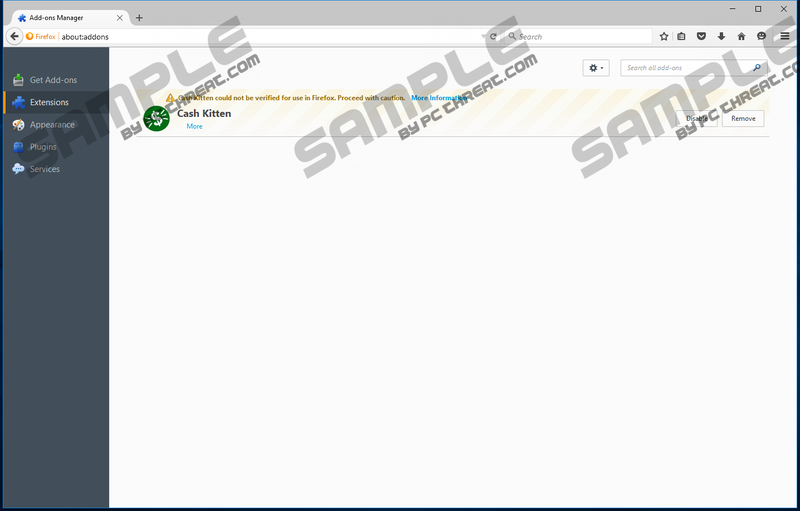 If you ever happen to come across a program called Cash Kitten, make sure not to download or install it as it has been discovered that this application is just your average adware program. It is important to ignore all the claims stating that this program could be helpful since they are misleading, to put it mildly. On its official website, this program is marketed at frequent online shoppers as it should present a great deal of useful discount deals, promotional codes, and coupons, which should consequently help you save money. Unfortunately, it is not entirely true. In fact, instead of helping you it will mostly cause numerous disruptions while you are surfing the web, making your online experience one a miserable one. If that was not enough, our research team has found out that at times Cash Kitten could even be the reason your PC might be exposed to suspicious or at times even malicious web content. If you are a security-conscious Internet user, a complete removal of this adware should be your priority. Make sure to remove it by following a detailed removal guide that we present below. At the moment, Cash Kitten is known to affect web browsers such as Mozilla Firefox and Internet Explorer. Even if your default web browser happens to be Google Chrome, you cannot feel entirely safe since any day creators of this adware could create a version compatible with it. As soon as this adware program enters your operating system and starts working, your web browser will get filled with a vast amount of questionable third-party web content. In most cases such content manifests itself as various ads, pop-ups, and coupons. What is rather unfortunate is the fact that none of those ads or coupons are actually useful. In reality, they will only interfere with your online activities. At times, you web browser could be flooded with such invasive web content so much that surfing the web could become virtually impossible. Additionally to frustration that Cash Kitten causes, it has been found out that at times this program might present you with suspicious ads or pop-ups. What it means is that those ads or coupons or pop-ups could host redirect links within them. This is an instance you do not want to find yourself in as you the outcomes on clicking on such an ad could be devastating. This is so because you could end up on a website that could turn out to be hosting suspicious or malicious content. For example, landing on a website that runs an arbitrary code execution exploit is more than enough to get your operating system infected with some questionable applications. It should be obvious that running this ad-supported program on your computer is a risky business; thus, its removal should be executed as soon as it is discovered active on your computer. To lower the risk of infecting your PC with Cash Kitten or any other suspicious program, you must take preventative steps to improve your overall virtual security. Firstly, you should avoid all third-party download websites since they are infamous for being the primary source of dubious installers, which could be filled up with questionable software. Software bundles are often used by malware distributors; thus, it is not surprising that Cash Kitten is often distributed in such a way. Secondly, you should never skip a single step of any setup procedure since you might miss out on an opportunity to cancel the installation of some unwanted program. Lastly, but most importantly, make sure to run a professional antimalware tool on your computer at all times since such a tool is capable of detecting any virtual threats in advanced. If you follow these preventative steps, a chance of infecting you computer with Cash Kitten or any other intrusive program will significantly decrease; in fact, not malware will be able to break into your PC. It is critical to delete Cash Kitten without hesitation since running it on your computer has obvious risks not to mention the fact that it does not exhibit any valuable features. The removal guide that we provide below will help you delete this adware application in just a few easy steps. Make sure not to skip any steps of the removal guide since just a single mistake could result in a non-complete removal. To avoid such situation we highly advise you to run an in-depth analysis of your computer for potential leftovers linked to this adware. Select the unwanted program and click Uninstall. Tap the Windows button on your keyboard. Click Start and select Control Panel. Confirm that you want to remove it. Quick & tested solution for Cash Kitten removal.